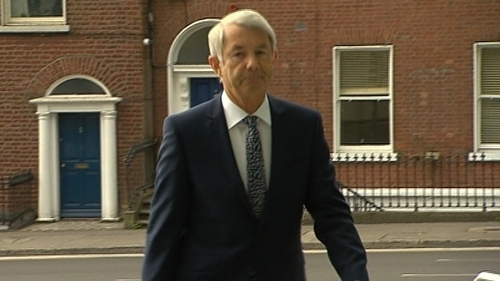 The trial of Independent TD Michael Lowry has been told that the politician would like the jury to believe that it had been "a tragic series of unfortunate events" that has led to him being before the court. It is alleged that Mr Lowry arranged for this payment to be made to a third party, Kevin Phelan, residing in the Isle of Man, and therefore it did not appear in the company accounts for that year. Remy Farrell SC, prosecuting, suggested to the jury in his closing remarks that the jurors "might want to stack up each one of these unfortunate events on top of one another, on top of another, on top of another" and ask themselves if they are "prepared to swallow this brick sideways". He then outlined a number of events which he said Mr Lowry and his defence team were putting forward as errors or mistakes by the TD. He said no invoice was issued for the €372,000. There was no paper record of it. His auditors were not informed about it when inspecting the 2002 accounts. Mr Farrell said Mr Lowry said he was paying money into the company before 2002 to help alleviate an anticipated tax bill against Garuda but he did not notice that this money was not being reflected in the director's loan account for the company. Counsel referred to a 2007 letter, which is an exhibit in the case and said this was when the "real misfortunate event occurs" because this letter talks about an invoice issued by Garuda that doesn't exist. Mr Farrell referred the jury to Norpe's former CEO, Fred Ramberg's evidence at the start of the trial. He reminded the jurors of an agency agreement which Mr Ramberg accepted he had changed so that Michael Lowry's name was crossed out and the name of Glebe Trust written in.Counsel said that Mr Ramberg testified that he made that change in 2008, which Mr Farrell said was six years after the €372,000 was transferred to the Glebe Trust in order for Mr Phelan to be paid. "This is a document created to support a narrative that is complete nonsense, to get Norpe off the hook in terms of justifying payments to the Glebe Trust," Mr Farrell said. He told the jury that they heard Mr Lowry's testimony before the appeals commission during which a €1.1m tax bill was successfully challenged. He said that much of the politician's replies to the questions asked of him were "nonsense on stilts, absurd" referring to Mr Lowry saying that he hadn't read into the figures when things were going badly for his company in 2002. Counsel said it "was utterly misleading and untruthful" for Mr Lowry to suggest to the appeal commission that he had left the responsibility of accounting for 2002 transactions to his accountants, BBT, as they had not been made aware of the €372,000 until four years later. "They knew nothing of this transaction in 2002.. were they supposed to find out through some form of telekinesis, read his mind, figure out this transaction and account for it," Mr Farrell said. He also asked the jury to consider why Mr Lowry and Garuda would deliberately leave this transaction out of the 2002 accounts and suggested that it could be to avoid paying corporation tax on it. "But also if they are concerned that the company is about to become insolvent, if it goes belly up, the money will be swallowed up," Mr Farrell said. He told the jury that the inclusion of the figure in the 2006 corporation tax return was "an attempt to cover up, put the toothpaste back in the tube". Mr Farrell said that in 2002 Mr Lowry engaged in this transaction to divert money from Norpe to Kevin Phelan and that he knew "full well" it wasn't reflected in the 2002 books or in the return for that year in 2003. He said in 2007 the transaction is deliberately accounted for. "He tried to ensure none of this comes to light. He tries to move the body," Mr Farrell said. "I suggest that the evidence is overwhelming," counsel concluded before he suggested that Mr Lowry was "absolutely aware" of what was going on and "invited" the jury to return guilty verdicts. Yesterday Judge Martin Nolan told the jury that a charge of delivering an incorrect tax return for 2002 had been withdrawn. At the start of the trial, Mr Lowry, 64, of Glenreigh, Holycross, Co Tipperary, pleaded not guilty at Dublin Circuit Criminal Court to four charges of filing incorrect tax returns on dates between August 2002 and August 2007 in relation to a sum of Stg £248,624 received by his company, Garuda Ltd and one charge in relation to failing to keep a proper set of accounts on dates between 28 August, 2002 and August 3, 2007. He further pleaded not guilty on behalf of Garuda Ltd to three similar charges in relation to the company's tax affairs and one charge of failing to keep a proper set of accounts on the same dates. The trial continues before Judge Nolan and a jury of three women and eight men.